Punk Rock Parents: I do have a weird thing. I do have a weird thing. You know those lists people do naming like 7 strange things about them. I usually skip such things because I don't do anything strange, but the other morning I noticed that there is a weird thing I do. And I have done for over 10 years. 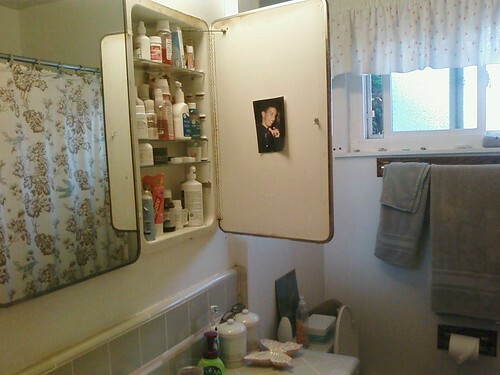 It involves my bathroom medicine cabinet and a photo from somewhere around 1992. So here the the back story. Back when Crissy and I were going to UCSB, our friend from high school, Vince was going to a school near by. We took a little weekend trip out to visit him. We talked, we laughed, we partied, we drank red wine and we looked through old pictures. One of the photos was from some formal function we went to in high school. Vince was wearing an awesome purple shirt with the gold chains. He was pointing and sort of winking and Crissy and I thought it was the best photo in the history of photos. So we stole it. When Crissy and I got home we confessed to Vince that we had stole the photos and then tried to find a place we would see it everyday. So we put it on the inside of our medicine cabinet. And there it stayed until we moved and when we moved we put it inside the medicine cabinet there. When Crissy moved out I kept the apartment and the picture of Vince. It has stayed with me and inside my medicine cabinet ever since. Now that is not the strange thing. Ha, ha, ha, ha. This is funny. I'm weird, I'm glad you are, too. p.s. the fact that the picture is in there is also the weird part! So jealous!!! I want the photo back... Maybe we can work out some sort of visitation/shared custody plan for the photo that was once ours? Oh, the sweet memories of that road trip to see Vince... Miss that guy!